If you aren’t happy with the way your smile looks or a major life event or occasion is coming up soon, cosmetic dentistry might be just the thing to give you a little lift. If you’d like to brighten your smile, we offer a service that will work for you. Whether you feel like a bit of whitening would do the job or you’re really after something longer-lasting that could completely transform your look, Stephens & Gatewood Dentistry would love to help. We love to smile with our patients! The #1 concern for adults and teens is teeth they feel are “white enough”—but fortunately, there are many different ways to shine! Dental veneers were originally invented to make movie-star smiles pop onscreen–and they can make you feel like a star, too! 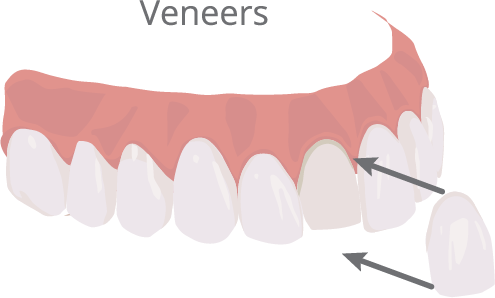 In some cases, we can create and place your veneers the same day! Porcelain veneers are thin, nonremovable cosmetic restorations. They are custom-fabricated to match the ideal shape and color for your teeth. Because they are so versatile, they are often included in smile design treatment plans. Common issues veneers can correct include cosmetic chips or cracks, excessive tooth wear, crooked or misaligned teeth, teeth with stains that can’t be removed with traditional whitening, or misshapen or oddly sized teeth. Minor cosmetic issues with the shape, size or color of your teeth may be remedied by dental bonding. Dental bonding is the application of tooth-colored material. Bonding requires little to no tooth preparation or anesthesia. Bonding can also protect a tooth root exposed by gum recession. It’s amazing how many different things bonding can accomplish in one non-invasive, same-day treatment. Bonding is a cost-effective alternative to veneers that preserves more of the natural tooth surface. (You may not know why this is important—just ask and we’ll tell you!) Bonding can also be completed in just one appointment. 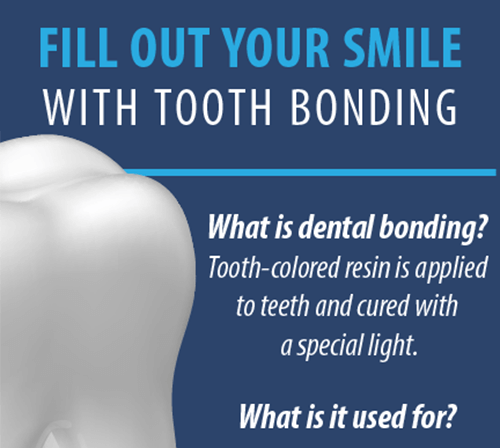 Bonding can correct some common dental concerns, such as cosmetic cracks in tooth enamel, chips, gaps, discoloration that resists whitening treatments, or disproportionately sized teeth. Deciding to do something just for you + our life-changing dentistry = a win-win! If you would like to learn more about our cosmetic dentistry options, get in touch today. Teeth whitening is a quick, budget-conscious way to get a smile pick-me-up. We have several different options. Zoom!® unlocks 8-10 shades of brightness in one visit. At-home kits with custom trays allow convenience. We can provide you with a bleaching kit for touch-ups. Is there anyone who doesn’t think about white teeth? If so—we haven’t met them! Foods and beverages can stain your teeth, including coffee, tea, soda, red wine, chocolate, curry and tomato sauces—even balsamic vinegar. It’s good information to bear in mind to maintain a favorable level of oral health. If you look in the mirror and groan, if you have an important occasion coming up (wedding, graduation, reunion)—or, frankly, if you just want to treat yourself—whitening your teeth can revitalize your smile and put pep in your step. Sometimes called a smile makeover, Smile Design is a customized treatment plan that gets you the smile of your dreams. Smile Design is a comprehensive solution for cosmetic dental issues. All your cosmetic issues are addressed in one treatment plan. Your plan will schedule treatments in a way that benefits you. You’re a work of art, and we’d love to add the finishing touches. We can address missing teeth, as well as color, shape, alignment, and spacing of existing teeth. Some patients don’t like their gums–the most common complaint is a smile that’s “too gummy”. We can help with that, too! Your Smile Design plan chooses specific cosmetic and restorative procedures that will work together to achieve the final results you’ve dreamed of. Dental crowns, whitening, gum contouring, veneers, and bonding are some of the choices that will be presented. Gums are very important when it comes to oral health—the gum tissue protects tooth roots and holds it all together. The #1 aesthetic gum tissue concern? A “gummy smile”. Some people also dislike the looks of uneven gum tissue. Gum contouring is performed with lasers—no sutures! When beautiful gums frame your dazzling smile, just watch– the world will smile back. Patients appreciate the noninvasive nature of laser gum recontouring, with little to no bleeding, no sutures, and more precise treatments. Those who disliked the appearance of their gums experienced increased confidence regarding their smiles and appearance following their procedure. Gum contouring cannot be performed in the presence of gum recession or disease. When these exist, periodontal treatment may be required prior to a gum contouring procedure. Gum contouring reshapes gum tissue (in one visit!) by using lasers. We’ll help you get a picture-perfect smile!